Diary Of A Wimpy Kid: Rodrick Rules is a delightful and humorous tale of two brothers who are worlds apart. 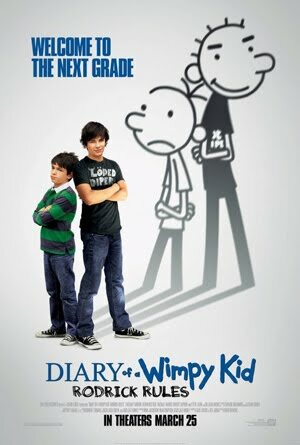 Greg Heffley (Zachary Gordon) and his older brother Rodrick (Devon Bostick) are always picking at each other, always breaking the rules and their parents have had enough. Mom, Susan, has just landed a job as an advice columnist for parents and in order to save face, she must get her own children to cooperate. She invests in a plan called, "Mom Bucks", and in order to earn them, the two must get along and hang out together. Rodrick thinks he has just hit the jackpot and Greg is dismayed that to learn that his brother is now getting paid to beat him up. Greg and his best friend, Rowley Jefferson (Robert Capron), are always getting themselves into sticky situations. They are not the best looking, nor the strongest, nor do they have any luck whatsoever, as the two are always trying to find a positive outlook to all the events that occur. When Greg first sets eyes upon the new girl, Holly Hills (Peyton List), he realizes this is the year when he won't be the nerd or the geek and he will win the girl. His friends thinks he is crazy, but with confidence and perfect timing, he is sure he can make it happen. After Greg and Rodrick get into trouble with their parents, they are forbidden to go on a family trip and must stay at home and get to know one another. They are strictly forbidden to have anyone over, however, the moment mom, dad and baby brother, Manny, have left, Rodrick is on the phone and telling his friends that there is a party at his house. It is here that Rodrick and Greg begin to bond as brothers, as the two realize the other isn't an ogre after all. However, truth always prevails and the two are eventually caught and grounded and Rodrick is not allowed to perform with his band, Loaded Diper, in the upcoming talent show. The two brothers resort to their old habits until Greg believes he has an answer to everyone's problems and a way to make amends. Will his mother and father agree?? Or will the rift between the two brothers never heal?? I really enjoyed this movie. I hadn't seen any previews on it, nor had I heard anything about it, so my view is fresh and untainted. I thought the humor to be placed with perfect timing and the chemistry between everyone in the film was amazing. The plot, though a bit recycled, I mean, you can only do sibling rivalry in so many forms, was wonderful to view, nonetheless. I found the approach of the two brothers to be believable and their antics to be such as siblings would do to one another. I loved the diary pages and comic strip caricatures dispersed throughout the movie, it gave it a childlike quality that gave the movie an extra added appeal. Often these takes were comical and left the room in hysterics. The jokes, even though some of them are cliched, were done with the right approach and were placed in the film such, that it worked for it. Steve Zahn's role of the father, Frank, was a bit stiff, he didn't seem to be as much into this role as I have seen him in others. However, Rachel Harris counters his parenting with a strong performance, leaving you to believe that mom wears the pants in the family. This is an excellent movie for families to enjoy, it is clean, with very few deragatory remarks/situations and the end message is wholesome and sacrificial and one that every sibling should adhere, for blood is thicker than water! Included on the one-disc DVD you will find extra footage including two summer shorts, the theatrical trailer, and audio commentary. The movie runs approximately 1 hour and 54 minutes and is close captioned. As well, they are subtitles offered in English, Spanish and French. Article first published as DVD Review: Diary Of A Wimpy Kid: Rodrick Rules on Blogcritics.